Elizabeth (Liz) Badamo is entering her junior year at Maine College of Art, in Portland, ME. She has declared a major in Illustration, with a double minor in Drawing and Creative Writing. After graduation, she plans on getting her Masters in Art Education. In her free time, she loves to spend time with her niece and nephew, read, write and do all things art related. 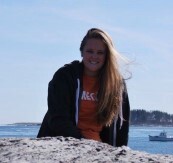 Liz is looking forward to her 2nd summer as part of the Maine Arts Camp family!